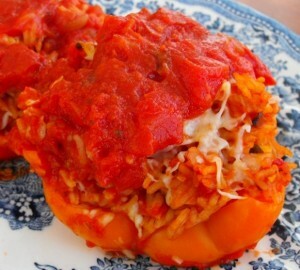 Stuffed peppers are a yummy, healthy way to enjoy all the nutrients in a variety of vegetables. Whatever’s in abundance in the garden can be chopped and added to the stuffing, and you can use fresh tomatoes instead of the canned crushed ones. This versatile recipe can also be used for making stuffed summer squash or eggplant. If you want a vegan recipe, use olive oil instead of butter and skip the cheese. The mushrooms in the stuffing give it a “meaty” texture, but you can always add ground turkey, sausage or hamburger if you have die hard meat eaters. If you have nothing to stuff, the rice mixture makes a nice side dish, too. You can adapt this recipe to satisfy everyone! Makes three hearty servings. Slice peppers lengthwise and remove seeds and membranes and set aside. In a large skillet, saute the onion in the butter or oil. After a few minutes, add the carrot, mushrooms and garlic. Season with salt and pepper to taste. While the vegetables cook, pour half of the tomatoes into the bottom of a baking dish. Arrange the peppers in the tomato sauce. Add the rice and remaining tomatoes to the skillet and stir to combine. Taste for seasoning and adjust to your taste. Fill the six pepper halves with the rice mixture and bake in a preheated 350°F for 30 minutes. Top the peppers with cheese, then continue baking for another 10-15 minutes. This recipe has been edited from a post previously published at Farmer’s Daughter. These sound delicious! We are vegetarian, so adding the mozzarella sounds super good, but I am sure it would be good without for our vegan friends. I just wish I could get peppers to grow here!